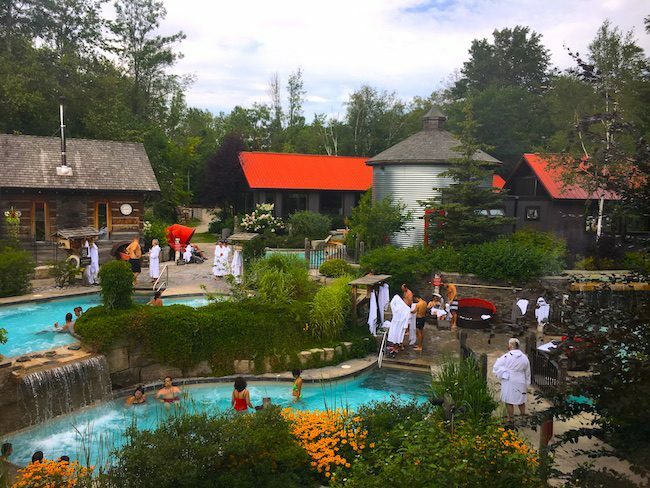 If you’re looking for a relaxing getaway in Ontario, a trip to Scandinave Spa Blue Mountain, just two hours north of Toronto, makes a serene stop. Is it romantic? That depends on who you ask. 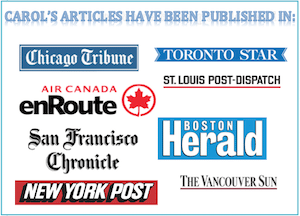 For all the essential information on how to visit and what to do there, read on. “It is?” he asked in surprise. “Seriously? You need to ask that?” I said. 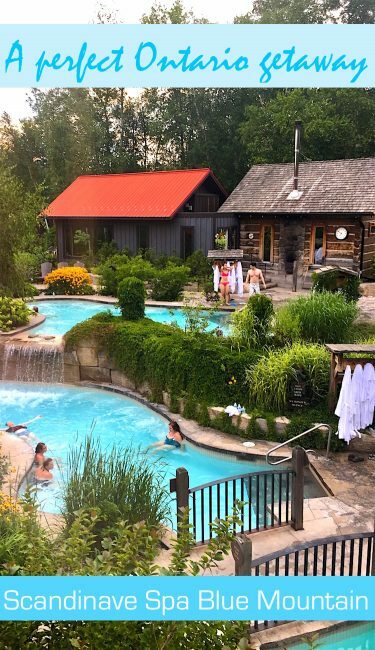 “It’s the most romantic destination of all.” Surrounded by a thick forest of birch, pine and maple, at the foot of the Niagara Escarpment, Scandinave Spa Blue Mountain is a refreshing escape made up of outdoor pools, faux waterfalls, saunas, steam bath and indoor and outdoor relaxation areas. It’s a spa where nature comes first and the smell of wood smoke adds an earthy scent to the fresh northern air. Sheesh, I thought. He probably thinks we just go for the sauna. 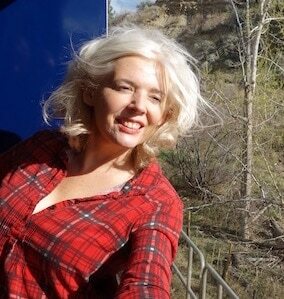 For me, Scandinave Spa Blue Mountain is a total bonding experience. Hushed and peaceful, this nordic-style spa in South Georgian Bay is one of the top day spas in Ontario, and my go-to destination to unwind and renew. And when I say renew I mean mind, body and relationship. 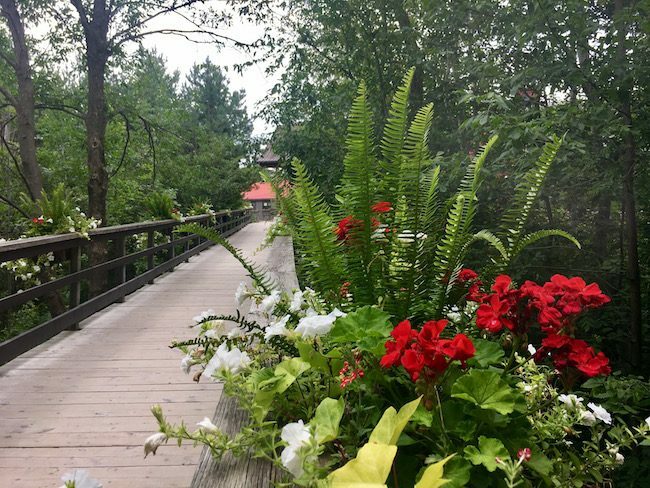 If you didn’t know Scandinave Blue Mountain was a spa where silence is golden, the sign saying Enjoy the Quiet at the wooden boardwalk leading to the spa should clue you in. A reminder might come when you’re soaking in the hot tub shouting, “See, I told you this was romantic!” to your husband and a staff member asks you to keep the noise down. Oops. Now that I think of it, that’s probably why Mark likes Scandinave, because I’m forced to stop talking. Tip: You’re allowed to talk quietly, just remember to use your whisper voice. 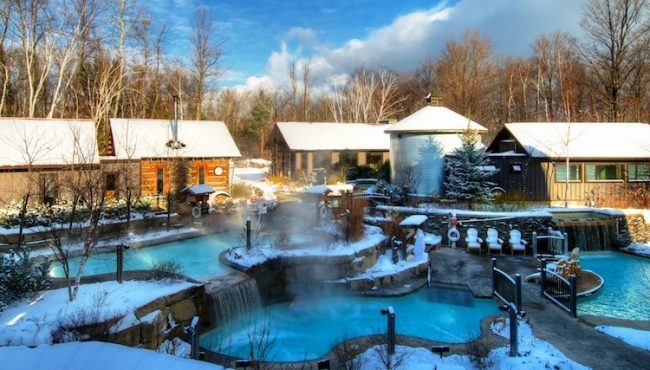 If you haven’t tried a Canadian nordic-style spa before, here’s what you need to know. Based on Scandinavian bathing traditions, a nordic spa is a circuit of hot and cold therapies followed by a short relaxation period. Mark and I usually start with a dry cedar sauna, then do a cold plunge then find a place to relax. And because we’re creatures of habit, we pretty much do that two or three times until I finally drag him into one of the three hot outdoor soaking pools. You could also start with the eucalyptus steam bath or Scandinave’s new infrared sauna. And, if a cold plunge is too much of a shock for your system, you could opt for a not-quite-so-cold pool instead. There are three of varying temperatures. If you’re hardy, you could even try a wintertime leap in the snow. The idea is to repeat the hot/cold/rest circuit at least three times, after which time you will feel like a wilted maple leaf, but a very content one. Finnish Sauna: The heat of the sauna stimulates your sweat glands (okay, so that part isn’t so romantic) and opens your pores. This helps to rid your body of toxins and is cleansing. Eucalyptus steam: Eucalyptus is good for respiratory problems by acting as an expectorant, a polite term that means removes icky stuff from your lungs. It also acts as a microbial and helps with sinus problems. 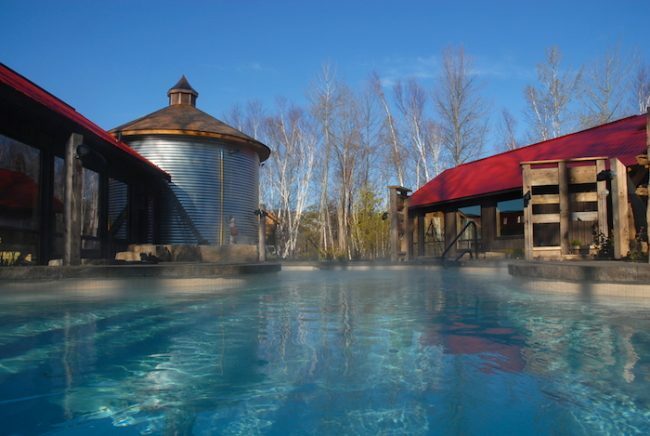 At Scandinave Spa Blue Mountain, the eucalyptus steam bath is in a round metal building that looks like a house the Tin Man from the Wizard of Oz might have built with all the heart in the world. It’s also very dark and steamy inside and if that doesn’t have romance written all over it I don’t know what does. Infrared Sauna: The buzz about infrared saunas is that they help rid the body of deep-seated toxins more than regular saunas do, horrible things such as mercury, lead and environmental chemicals. Infrared saunas are electric rather than wood fired and they’re not as hot so Mark, who is a sauna hog, prefers the good old-fashioned Finnish sauna. Try them both and see what you like. Hot Baths: Scandinave has three outdoor hot pools. The hot water helps to relax muscles and soak out stress, and the combination of cool fresh air on your face and hot water enveloping your body is, frankly, unbeatable. My husband disagrees. Did I mention he’s a sauna hog? The second stage of the bath circuit is a vicious but invigorating cold plunge. This closes the pores, increases the heart rate and boosts your blood circulation. It also makes you want to scream in horror, putting you at risk for another silence warning. Yet the cold plunge is strangely addicting because once you’ve emerged from the pool, you get such a powerful zing of energy you’re pretty sure you could run up the Niagara Escarpment at least three times and then kayak across Georgian Bay. The third stage, the recovery stage as I call it, is when the body rebalances itself. This is when you realize you’d rather lie in a hammock and read In Touch Magazine than tackle Georgian Bay in a kayak after all. Your mind has also been cleaned out along with the toxins, which is why reading Dostoyevsky instead of In Touch is not advised. At least that’s what I explained to Mark, who was dragging Dostoyevsky’s The Devils around with him. And whether your partner realizes it or not, wellbeing and nature is the most romantic combination of all. The spa offers three types of massages: Swedish, Hot Stone Therapy and Sports Massage. (There is also a Pregnancy Massage but please note that the bath circuit is not recommended for pregnant women.) Spa treatments are either 60 or 90 minutes and are done by registered massage therapists and start at $145. 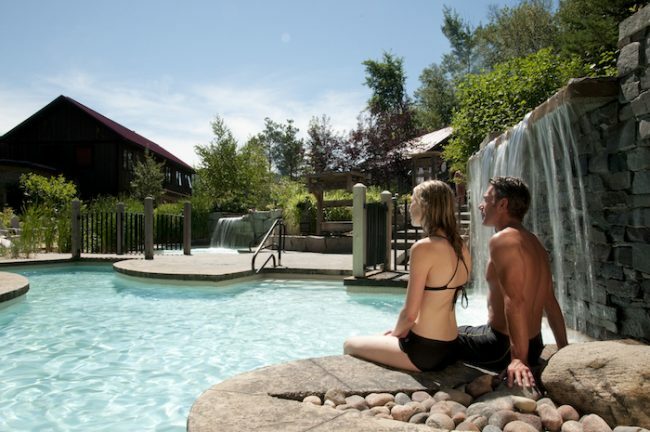 Scandinave Spa Blue Mountain has 13 treatment rooms including 5 couples massage rooms. The price of a massage includes access to the baths. What do you need to bring to Scandinave? A bathing suit is essential. Flip flops or sandals are recommended. You can bring a robe, rent a robe there or just use a towel. Two towels and a locker and key are provided with your entrance fee. Personally I’m lost without something to tie my hair back. You can buy a bottle of water there or drink from the fountains, but it’s a good idea to bring a water bottle. Amenities in the change rooms include soap, shampoo, conditioner, body lotion, cotton pads and hair dryers. The baths are open everyday from 10 a.m. to 8:45 p.m. except for Christmas Eve when they close at 6 p.m. and on Christmas Day when they are closed. Is there a restaurant at Scandinave? Yes. There is an onsite Bistro with light food such as soups, salads and snacks. 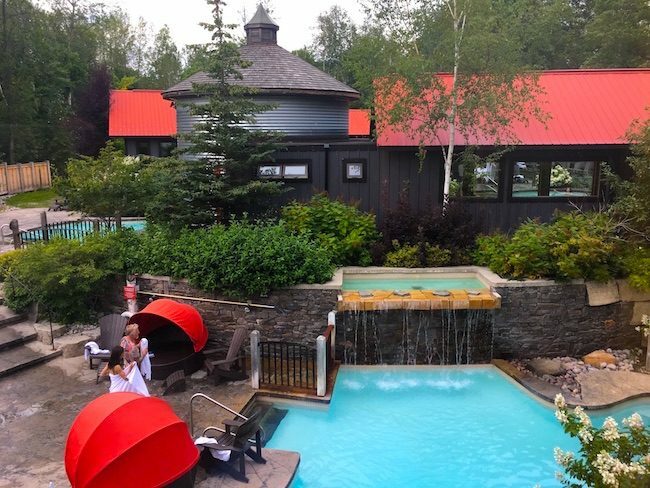 Scandinave Spa Blue Mountain is an affordable luxury. Bath access is $55 or $45 on Unwind Wednesdays. Do you need to make reservations for the baths? No. The Scandinave bath circuit is first come first serve. There can be lineups on busy times such as weekends and holidays so try to go in off hours or be prepared to be waitlisted. For massages you need to make reservations in advance. Bonus: You won’t have to wait in line. Scandinave Spa Blue Mountain is open to adults 19 and up. The spa offers various packages. A Scandinavian Package includes a 60-minute Swedish Massage, access to the baths, robe rental and a personal vanity kit. $160. A Solace & Savour Package includes a Swedish Massage, access to the baths, robe rental, a tea time break and a Signature Water Bottle. $165. Various accommodation packages are available also. Visit the website for more information. We usually stay at Blue Mountain Village. Two we like are the Grand Georgian and the Westin Trillium. 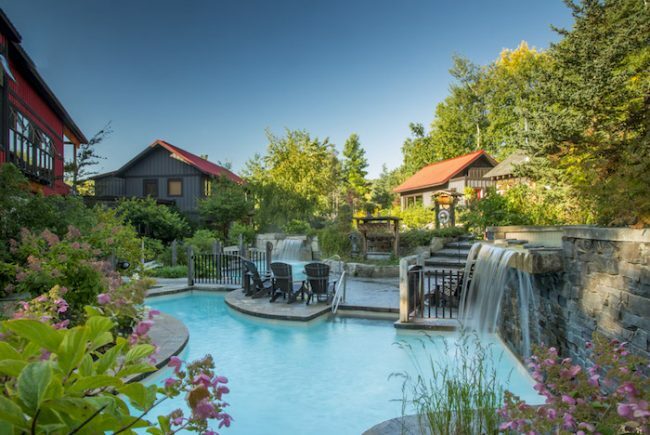 The spa is minutes away from Blue Mountain Village, a holiday village and popular ski resort that makes a great base for an Ontario getaway or a weekend escape from Toronto. Scandinave is 6.5 km from Collingwood, 27 km from Wasaga Beach and about 160 km north of Toronto. I love spas so this is definitely right up in my alley! Love that they have different treatments – hot and cold. This place is ideal for a romantic getaway or simply to relax after a long weekend of work. Great find! The Scandinave Spa really looks as exotic as it can get. The treatments look really luxurious. The eucalyptus steam treatment really sounds very soothing. Love the aroma of eucalyptus and it has some amazing health benefits. When combined with steam, it is sure to transform into an elixir of life literally. Just two hours from Toronto would make for a great overnight / weekend trip. 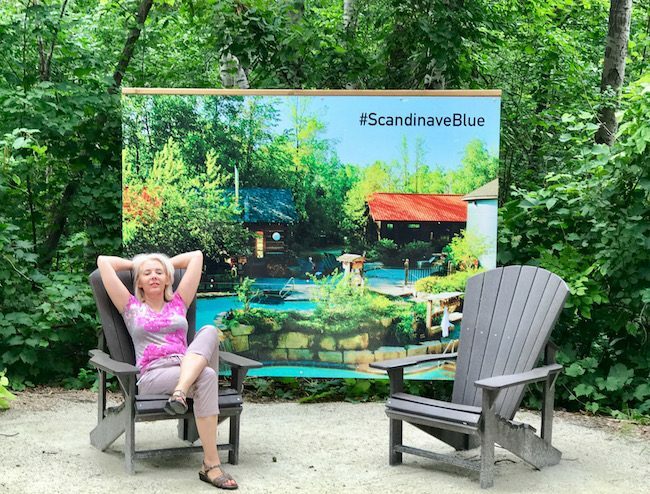 Haha I probably would have had the same conversation with my husband – Scandinave Spa Blue Mountain does sound romantic! I agree that this type of experience is about being able to bond a connect again within your relationship. I haven’t tried a Canadian nordic-style spa before, but it does sound like it has a lot of health benefits … if not a little shocking when you jump into the cold! Eucalyptus steam sounds great – we have a lot of Eucalyptus here in Australia, and whenever we came down with something, my mother would put Eucalyptus oil in boiling water and close our bedroom door – a DIY steam room of sorts! I love these type of nature spas! I wish we had some near Banff. I went to this exact one two years ago. It was bliss, but can get crowded. I had to laugh at the signs advising spa-goers to check Twitter before arriving in case they were at capacity. Fortunately, I got an outdoor hammock. This place looks so peaceful! I could really go for a spa trip! For me, I wish you COULD take photos there, Sara, but no. You can only take pictures of Scandinave Blue Mountain from the upstairs reception area. Once you’re down there, you can’t. I agree, Alouise. Scandinave is an affordable spa luxury. The good thing is, you only need to do the cold plunge for a few seconds, Roff. But so many people hate it, so you’re not alone. It’s my dream to do a hot springs tour of Japan, Kiyoko. I love steamy outdoor pools and spas. This place looks like heaven, I am a massive fan of spas. Although I did laugh a few times reading your post – my “whisper voice” also needs some gentle encouragement to manifest ;) Like your husband, am also a fan of the Finnish saunas but I am really bad at the cold treatments – can never do more than a few seconds. Spas are a great luxury travel experience though, thanks for sharing! This sounds absolutely amazing! While in Japan, I visited several onsen (hot springs), and I absolutely loved them because they were often surrounded by rocks, flowers, and trees or bamboo. It made for such a serene and relaxing atmosphere. I’ll have to check this place out as well! I’ve never been to a Nordic style spa like this before, but it sounds pretty lovely. And $55 for a day at a spa is a pretty affordable little luxury. Too bad I’m not near Toronto, but if in the area I’ll check this place out. Ahhh yes…one of the most relaxing experiences ever. I was to one very similar in Winnipeg. I loved the fact that visitors were not allowed to take photos. With everyone running around with phones today, it was nice to know that one could truly relax without worrying about showing up in someone’s photo online. There are not many places today where you can experience that. Could you take your own photos here?